KISS ROCK THE NATION – LIVE! The new War Machine is now Dressed To Kill. 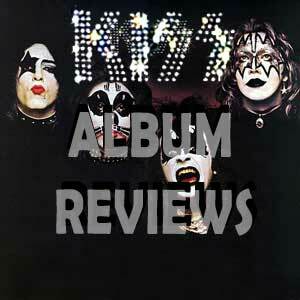 For a KISS fan, KISS: ROCK THE NATION – LIVE! is the same great product we’ve come to expect from the Hottest Band In The World, their 11th video/DVD release; for a new fan or a non-fan who would like to sample KISS before diving in, this DVD is as good a place as any to start; a two-disc presentation of a live show interspersed with excellent bonus material; great sound and picture quality and a cross-section of songs from different eras. 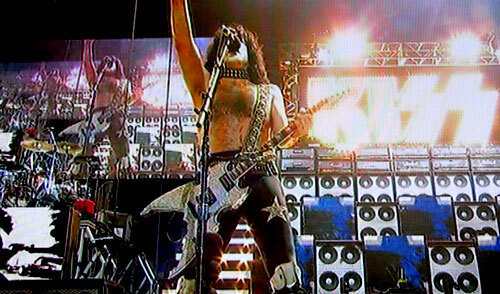 Filmed in Washington DC and Virginia Beach VA, on July 24/25, 2004, ROCK THE NATION is another example of KISS utilizing the DVD medium to provide the best features it can offer. No matter the empty-headed complaints about the venality and avariciousness of the KISS Empire (Simmons an especially favorite target), the quality of KISS product is always exceptional. Maybe you don’t “like” the product – then don’t buy it. But for the fan/collector of the band’s merch (including this, the music, the bedrock upon which the empire is built), KISS always – always – provides more than your money’s worth. For NATION, this means interspersing live concert footage with behind-the-scenes footage of rehearsals, soundchecks, photo shoots, etc., and utilizing “Powervision” – a fancy application where the viewer can choose to watch any individual band member throughout a whole song (that is, during 7 select songs scattered through the concert, you can choose to watch the normal concert edit, OR view only one particular band member during that song; you can also switch between band members during the Powervision; an excellent facility for musicians who want to view unbroken takes of how each member performs his parts, or an education on stage coverage from some of the best exponents of it, or just fan worship for the non-musician). By this date, 2005, the KISS live show is bigger and more bombastic than ever. 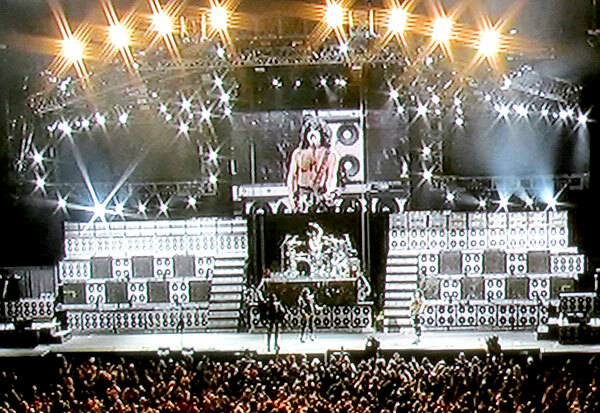 Besides the giant repeater screen behind the drumkit, there are two massive KISS lighted logos, and interspersed with the Great Wall of China speaker cabinets are more tiny repeater screens, synchronized with various video graphics. Nice to hear the modern version of Makin’ Love; always loved the thick syrup of that song on record (Rock And Roll Over, 1976); welcome the melodic Tears Are Falling, resurrected for live play (Asylum, 1985); and – wow! – a deep cut from deep time, Love Her All I Can from the third album, Dressed To Kill, 1975. …And the first video that features this lineup in full war regalia; Thayer is still wearing Ace Frehley, and though Singer was wearing The Cat even before Thayer joined the band, this is the first video where all current members – the all-new War Machine – are in Classic Kiss makeup, somehow sealing the blasphemy for a contingent of fans who refuse to move forward with their once-favorite band. Will there ever be surcease for the Frehley-versus-Others feuders and Makeup-versus-non-Makeup diehards?! I’m here to tell ya: Give a little sugar to Tommy, diehards! This guy dropped feet first into one of the best gigs in the universe, hit the ground running, and is pulling off the distinctive parts of Frehley, Vinnie Vincent and Bruce Kulick more than admirably. He also co-produces the DVD, and edits the behind-the-scenes footage. Much respect and love, Tommy! We can all only dream of our fifteen minutes arriving and riding that whirlwind with such verve. Stanley surprisingly gets political near the end – or as “political” as an iconic rock and roller is allowed to get without being banned, boycotted or spat upon. Before God Gave Rock and Roll To You II, he actually states there are “terrorists in the world who are intent on destroying the United States of America – and we will not let them!”, extolling the greatness of America and exhorting his audience to subvert terror by “walking around with a smile on your face,” ultimately dedicating the show to the troops overseas. Strange to hear those words coming from Stanley’s mouth from a KISS stage; all their career, they’ve kept the stage pretty clean of politics, but I guess we all grow older, wiser and mouthier. Approximately ten years after the so-called “Reunion Tour,” the actual “reunion” has long since fallen apart, but no matter – as Paul definitively states to the kids in the audience, “We were there for your parents, we were there for your brothers and sisters, and we will be there for you!” – the eternality of KISS will continue to ROCK THE NATION! aka: KISS: ROCK THE NATION LIVE. 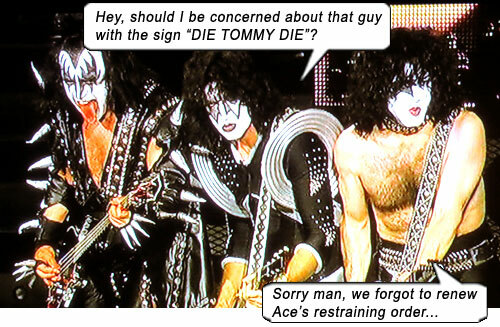 Starring: Paul Stanley, Gene Simmons, Tommy Thayer, Eric Singer. Powervision: See those four small screens down the left side of the screen in the Parasite video? There is one band member focused on in each of them. On the DVD, you can click on your choice of member and that screen will switch places with the main concert footage, meaning the main screen becomes one of those small screens. A great concept – and must have been a programming nightmare!